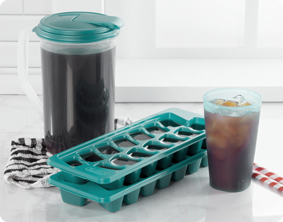 Keep your drinks cold with the Set of Two Ice Cube Trays. Its dishwasher safe and designed to channel water so trays fill quickly and evenly. 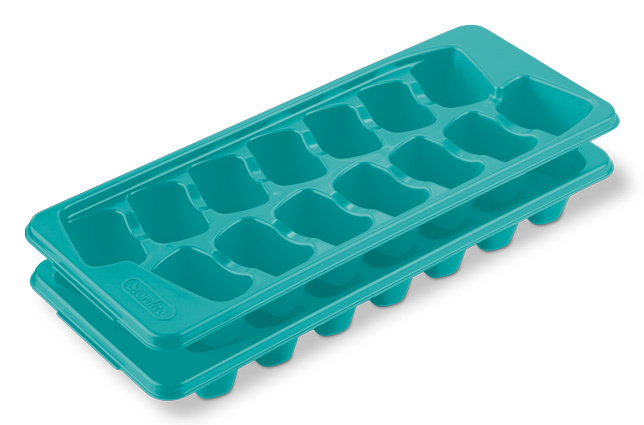 The Ice Cube Trays nest efficiently when not in use and when reversed on the opposite side, it stacks easily in the freezer without sticking to each other. The new rectangular shape allows ice cubes to release with an easy twist, much simpler than previous models. Fourteen rectangular ice cubes form in each tray to ensure there is enough for many drinks at once. 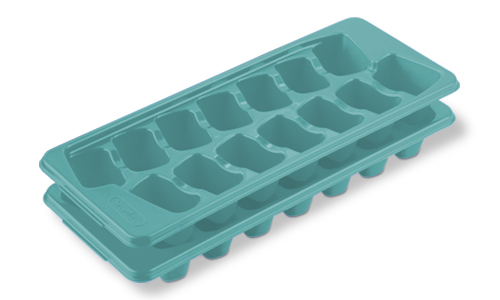 The Ice Cube Trays are BPA-free and phthalate-free. The overall dimensions of this item are 12" L x 4 3/4" W x 1 5/8" H.
Overall Assembled Size: 12" x 4 3/4" x 1 5/8"
Set of Two Ice Cube Trays is rated 1.7 out of 5 by 6. Rated 1 out of 5 by Lebowski from Useless If you only intend to use one tray or have freezer space to set them side by side, you may have better luck than me. Otherwise, there are two major issues with this product, both effecting practical use. First and foremost, you CANNOT stack these things. The way they're made, there's no bracing at all. You can try to offset the top one slightly and do a balancing act, but it's most likely gonna shift and drop down into the bottom one before the water freezes enough to support it, causing it's contents to well up out and all over the freezer and anything under the rack you may have placed them on. Second, once the water does freeze and you twist the tray to loosen the icecubes, most of the time only about half of them break free and you have to fight with the rest. Could run it under tap water, but either the remaining cubes will end up in the sink or if you tried to hold the ice bowl under it you'd obviously end up with a bowl full of water. Drain it and put it in the freezer? Obviously no good, as the presence of moisture just causes them to freeze together in clumps and freeze to the bowl. Bad design, bad investment. Rated 1 out of 5 by Rob03 from It's unanimous... this product is garbage These are by far the worst ice cube trays ever made. Within 2 weeks the item began to crack. After 1 month they are completely useless. The worst part is I thought my kids were not filling the treats completely, but that wasn't the problem. Several of the reservoirs were cracked which caused the water to leak all over my freezer and the items in it. So now I have to defrost everything so I can get rid of the ice. DO NOT BUY THIS ITEM. thank you sterilite for taking something as simple as an ice cube tray and using it cause this much frustration. Rated 1 out of 5 by Lisa65 from Waste of money Within the first week of use the first tray cracked, now two months later both trays have several cracks in places I have never seen an ice cube tray crack in, rendering both unusable. Save your money and buy a different brand! Rated 1 out of 5 by Disappointed from Would have given it zero stars if I could have! Within the first few days of use had several large cracks making it completely unuseable. Might be the worst quality thing I ever bought. Huge disappointment. Save your money...don't buy this. Rated 1 out of 5 by Sweetpea01 from JUNK, JUNK, JUNK! NEVER EVER BUY THIS PRODUCT! the mist frustrating product ever! You'll break the tray before you ever get an ice cube loose! Junk junk junk. Never ever buy this product! This is the most frustrating product ever! You'll break the ice cube tray before you ever get a loose ice cube. A total waste of your money!